An eclectic selection of works for violin and guitar bringing French, Italian and Latin classics together with newly composed Australian compositions. 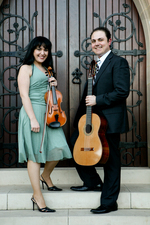 Performed by highly acclaimed local artists , Victoria Jacono-Gilmovich and Giuseppe Zangari. spaces are limited. email to reserve your seat!